Callout extensions are a great way to highlight your offers alongside your adverts in Google search. Callout extensions will allow you to add more text under your adverts to highlight your free shipping, discounts and more! Callout extensions are in many ways like sitelinks, however, they don’t link to pages within your website. They should be used to highlight your unique selling points and benefits. Sitelink extensions allow you to display up to 4 callout extensions beneath your advert that are a maximum of 25 characters long. 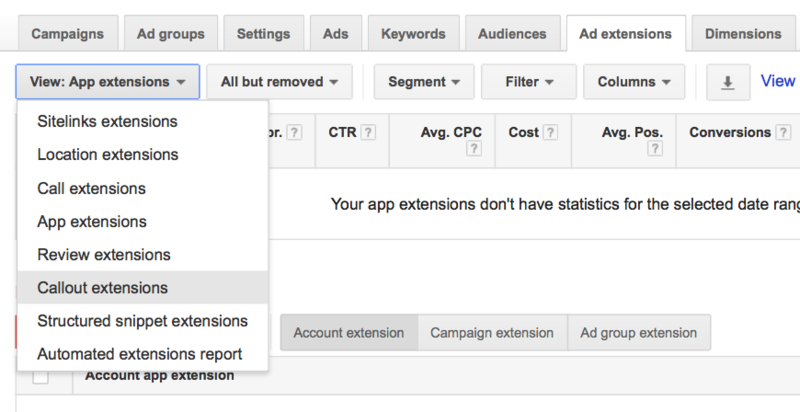 Callout extensions can be accessed through the ad extensions tab within your Adwords account and I will be showing you how to set them up, step by step later on in this article. Callout extensions can be displayed alongside your other ad extensions such as call extensions, sitelink extensions and seller ratings and can be added at either campaign or ad group level. Callout extensions are a no brainer really because they allow you to occupy more real estate on the first page of Google, which in turn helps to increase your click-through rate. This extra line of text not only has the ability to make an ad larger in size, but also allows for additional messaging beyond the normal 95 characters Google offers. Not only this, but they don’t cost you a penny more and allow you to drive more traffic and increase your conversion rate. They are also now included in the ad rank formula so by not using these you could be hurting your campaign performance. The short answer to that question is YES they do work, but if you’re not convinced here are two pretty conclusive case studies showing their effectiveness. PPC Hero ran two tests to determine the effect on performance by adding sitelink extensions that lasted 30 days. The first test campaign used only account level callout extensions and the second used campaign level callout extensions. The results from the first account were staggering, they saw an increase in click- through rate of 221% and a conversion rate of 40%. The results from their second test were still very good with an increase in click-through rate of 38% and an increase in conversion rate of 20%. It is hard to know how true this test is without more information on other changes that may have taken place at the same time that may affect click-through rates and conversion rate, such as creating new ads, updating keywords and making changes to bids, that would skew the results. In the first test the advert’s average position was 2.2 without callout extensions and 1.6 with callout extensions, which will account for some of the increase in conversion rate. BidCops also conducted research into the effectiveness of callout extensions for increasing the click-through rate of adverts. They conducted research on three accounts and saw improvements in click-through rate on all three accounts. After implementing callout extensions on two accounts they saw an increase in click-through rate of 20% and 11% on the third account. They did, however, state that it was the sales season which would naturally lead to higher click-through rates, however, it is unclear how big an impact this would have made to their click-through rate. They also mentioned that this was not a completely controlled test and there were some other ongoing changes made to the account which may have made a positive impact on their click-through rate, therefore, slightly skewing the results. You can add your sitelinks at either ad group, campaign or account level, which gives you a lot of flexibility. If you add them at account level they will be eligible to appear next to any of your adverts. If you add them at campaign level they will only be eligible to appear next to any of the adverts within that specific campaign. If you add them at ad group level they will only be eligible to appear next to adverts within that specific ad group. The first place you want to start at is your account level. This will allow you to get more real estate for all of your adverts, straight away with only a few minutes work. What you need to do is select callout extensions that will resonate with all of your adverts within your campaign and add these first at account level. Once you have created account level sitelinks you want to dive in deeper and create more specific campaign and ad group level sitelinks. By doing this and by being more specific, it will improve your click-through rate and conversion rate. When you are running a promotion, callout extensions are very useful as they allow you to display your promotion with your adverts without having to create new ad copy every time. This is especially useful if you are running site wide promotions and you have a large number of adverts. 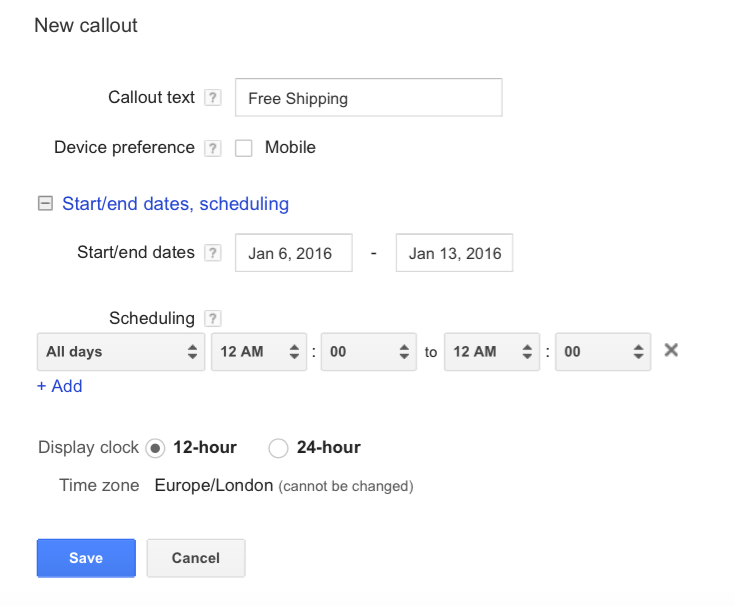 When using callout extensions for promotions you should also consider using the scheduling option. This allows you to set when you want your callout extensions to be displayed alongside your adverts. By creating a schedule, you can display your promotion alongside your adverts while you are running your promotion and then when the promotion ends, your callout extensions will be automatically paused. The scheduling option allows you to choose what time of the day and what days of the week that you want your callout extensions to show. This is very useful in several situations, the most obvious one being promotions, like I have mentioned above, as this allows you to automatically pause your callout once your promotion has ended. Other examples of where you may want to use this is so that you don’t display a ”live chat available” callout extension when your support desk are not online or to stop your ”next day delivery” callout from appearing on weekends as you might not be there to ship products out. A big mistake that many marketers make is that they set and forget their callout extensions. By this I mean that they create a list of callouts, leave them to run and then forget to come back and optimise them. You need to test your callout extensions the same way that you would your adverts, by creating several, letting them run for a period of time to collect some data and optimising them by removing the poorly performing one and creating new ones in their place. You will see that some callouts have performed better than others. At this point you want to order your list by click-through rate and then remove your poorest performing callout extensions and create new ones in their place. When comparing the performance of callout extensions to split test them, compare them relative to other callout extensions as opposed to the overall performance of your account. 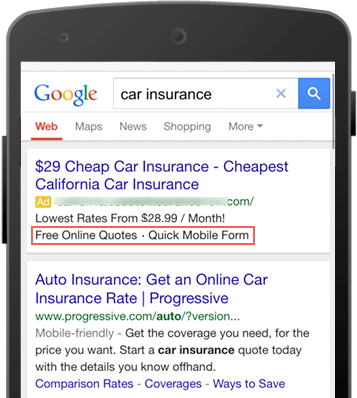 Google advise that you create mobile specific callout extensions. The main reason for this is due to Google’s recent Ad Rank update. By creating mobile preferred callout extensions, you should improve your quality score which will increase the chances of your callout extensions being shown on mobile devices. This also allows you to change your message to reflect the device that your callouts are being shown, as well as being able to exclude your callout extensions being shown on specific devices. Even though the maximum callout extension length is 25 characters, you should instead keep them shorter and limit them to 12 to 15 characters according to Google. Although this may seem to go against everything that you have been told about ad copy best practices, this is an effective technique as it allows you to fit more callout extensions side-by-side. Google suggests that you treat callout extensions like bullet points as opposed to trying to use full sentences. So, for example, if you offer free shipping, you should create a callout that says ”free shipping” as opposed to ”we have free shipping”. By treating them as bullet points you will also ensure that they make sense in any order, which is important as Google does not allow you to choose which order your sitelink extensions will appear in. 4 is the maximum number of callout extensions that can be shown with your advert. So, to ensure that you get the most out of callout extensions, you should ensure that you have at least 4, but preferably more so that you can test which ones perform the best. Once again this may seem to go against ad copy best practices, as you should usually use title case for your ad copy, however, Google have released data to show that using sentence case works best. For those of you who are unfamiliar with the meanings of title and sentence case, title case is where you capitalise the first letter of each word and sentence case is where you only capitalise the first letter of the first word. If you are struggling for ideas for your callout extensions, then you could use some of these 92 callout examples put together by 91digital.net. Click here to download their list of 92 callout extensions. If you have not already setup callout extensions then I would recommend finding a dozen from their list that could apply to all of your adverts and then applying them at account level. Another article that I would recommend reading, that shows some great examples of callout extensions being used by companies, is ”Great examples of adwords callout extensions in Google” which was written by Corey Frankosky and was posted on the visibility and conversions blog. It has 5 great examples of callouts being used in different industries such as: fashion, finance and the automotive industry. The maximum callout extension length is 25 characters, with the exception of languages that use double width characters such as Japanese or Chinese where the maximum callout extension length is just 12 characters. Symbols must not be used within the text of the callout extensions and, with respect to punctuation, your callout extensions must not include any exclamation marks, punctuation at the beginning of the callout text, repeated punctuation or emotions. Google do not allow advertisers duplication or repetition of callout extension text, with other callouts, ad text or sitelink extensions. Trademarks within the callout text must be in line with Google trademark policy. 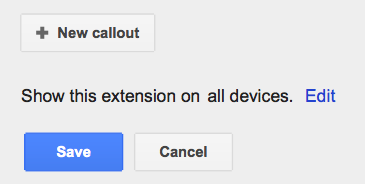 Google callout extensions are only available on the search network and the search network with display select. After you have heard about the benefits of callout extensions, I would imagine that you are itching to start creating sitelink extensions for your own account. So here is my step-by-step guide to creating your first callout extensions. Step 1. Navigate to the ad extensions tab and select callout extensions from the dropdown. Step 3. Select at what level you would like to add your callout extensions. Step 4. Click ”New callout”. Step 5. 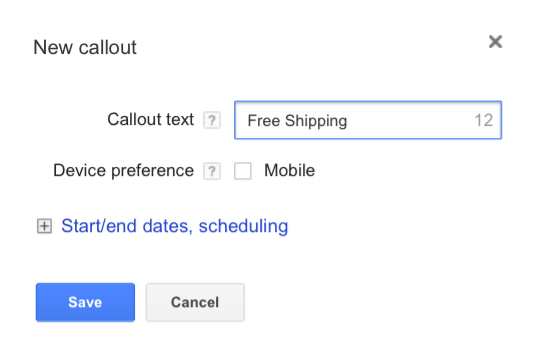 Enter the callout text, this is what you want your callout extension to be, for example, ”Free shipping”. Step 6. If you would like your callout to only appear on mobile devices then check the mobile preference box, otherwise leave this box unchecked. Step 7. If you are using your callout extensions to highlight a sale or promotion that you are currently running then you should use the ”start/end date, scheduling” settings to set the times and days that you want your callout extensions to run. This way once your promotion is over, your callout extensions will be paused automatically. Step 8. Once you are happy with your settings click save. Why are my callout extensions not showing? Your callout extensions will not be shown with every impression of your adverts and this is normal behaviour. Google decides whether or not to show your callout extension based on its ad rank, the quality of the callout and whether it meets Google’s basic requirements to show. So let’s look at these elements in more detail. 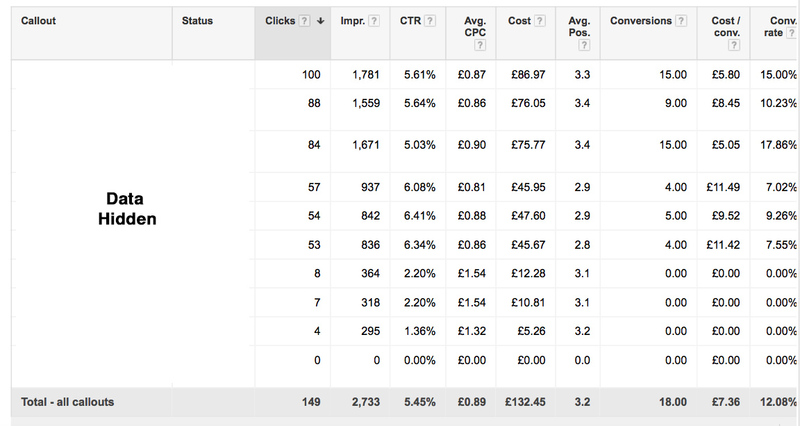 Ad rank is based on the keyword bids, your quality score, and past performance history of your adverts. To improve your ad rank and increase the chances of your callout extensions being shown alongside your adverts, you should work on your quality score and possibly look to increase your bids. Google have verified that when you have several ad extensions their ad rank formula will choose the ones that are the highest performing and most useful to its users. So another reason that your callout extensions may not be showing is due to the fact that another combination of ad extensions may be performing better. For your callout extension to show, you must have a minimum of two callout extensions and they must not have been disapproved for violating Google’s advertising policies. If for any reason your callout extensions have been disapproved for violating Google’s policies, then you should read the ”Google’s callout extensions guidelines” section of this article to diagnose why your callouts may have been disapproved. Callout extension reporting operates in the same way that reporting works for other extensions, however, there are limitations to the amount of data that you can analyse which I will explain in a moment. To gauge the effectiveness of your callout extensions you can view your report in the ad extension tab. This will show you the data for your adverts while your callout extensions were being shown. You can then compare this data with the campaign or ad group data for your callout extension to see if it has improved the performance of your campaigns. I have then gone to my callout extension tab and found the data for the same timeframe when callout extensions were shown. To see this data go to your ad extension tab, select view callout extensions from the dropdown, and you will see a statistics table. Here you will see that when callout extensions were shown alongside the adverts the click-through rate was considerably higher. When callout extensions were shown, the average click-through rate was 5.45% compared to just 3.67% when they were not shown. You will also be able to see that callout extensions were only shown approximately 20% of the time by comparing the number of impressions when callout extensions were shown and when they were not. Here all of the callouts were account level ones, however, if you want to track the performance of campaign level or ad group level callout extensions, then you should compare the statistics for an individual callout extension to the statistics of the campaign or ad group that it applies to, as opposed to your account level data. However, there are limitations to using this method to analyse the effectiveness of your callout extensions. When you look at your ad extensions tab this will show you data for the total clicks on your advert while callout extensions were being shown. This can be any type of click, it could be a click on the headline of the advert, a click on a sitelink, or even somebody clicking on your click-to-call extension and this can be viewed by segmenting your data by click type. The problem with this is that you can’t isolate the performance of your callout extensions as you don’t know which other extensions may have been shown alongside your advert and what effect they may have had on its performance. Callout extensions are clearly a very effective method of increasing the performance of your adverts. By simply spending 10 minutes today you can implement callout extensions at account level and start seeing the performance of your adverts increase within a matter of hours. However, if you want to get the best results you’re going to need to spend time and implement them at ad group and campaign level to display the most relevant callouts. If you’re still adding features such as next day shipping and your huge range of products within your ad copy, now might be the time to take these out and add them as callout extensions instead, to allow for extra space to add a call-to-action to your adverts. However, you still want to ensure you keep your main USP, as callout extensions will not be shown 100% of the time. Excellent article with useful information.